As a scientist, artist and graphic recorder I use my skills and experience to provide Creative Education for kids, students, teachers and educators. I literally ‘draw upon’ my research, professional experiences and the Australian Curriculum to create visual stories and STEM-related learning activities — where I enthusiastically put the “A” into STEAM (Science, Technology, Engineering, ARTs and Mathematics)! This year I introduced a new visual learning technique into my school visits, “Sketchnote your Science“, which I deliver as my alter ego Dr Suzie Starfish. I use Sketchnote your Science in Schools to help students and teachers to visualise SCIENCE. Sketchnotes are visual notes created from a mixture of hand-drawn words and pictures which can include visual elements of typography, shapes and lines. Drawing is thinking so this technique helps to make learning and science visual. Because…“When you draw you remember more!” AND what a great reaction I have had from high school science students and teachers! The photos show how you can put fun into science and learning with just a pen and paper! Here is some great feedback received from one of the teachers I visited, “Dr Starfish tailored a session for us on the tagging and life cycle of The Green Turtle using ‘Sketchnote’ a visual learning tool of drawing pictures, labels and links, to better retain and recall our scientific content”. 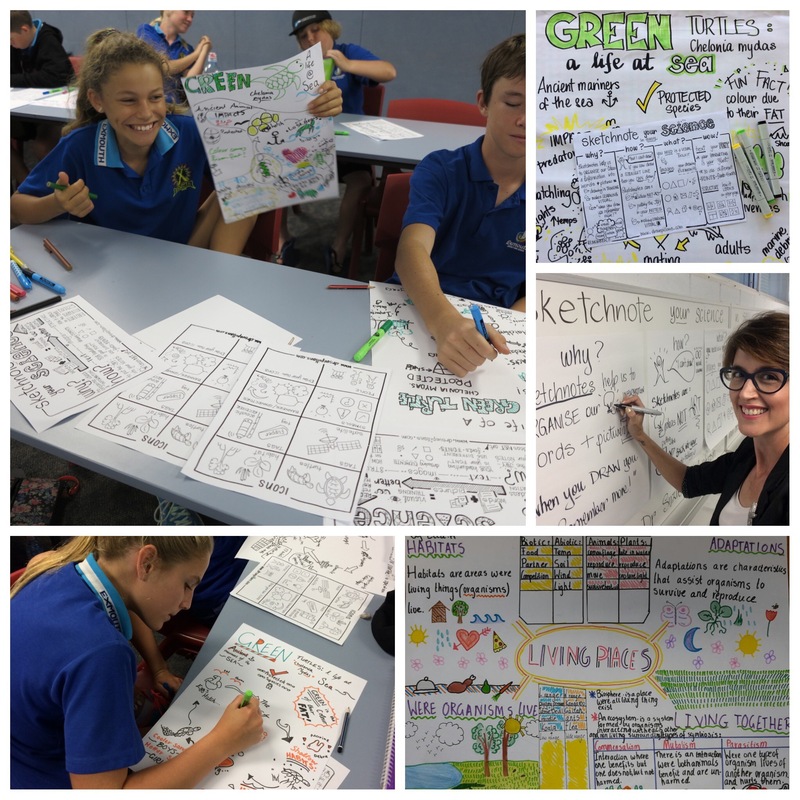 Teachers in Western Australia have now started using this technique after my school visits with amazing student science sketchnote results, which you can see via the link below! The beauty of this visual learning technique is that it can also be used in any group/team situation to help visualise ideas and understanding. Let me know if I can help your classroom, school or group to “picture your ideas“. You can ‘sea’ more of my visual learning technique for schools and groups via Sketchnote your Science and follow my creative journey via @suepillans on Twitter and Instagram.